Robert E. Howard Days: Wait...what? Howard Days is Over?! The adrenalin has finally subsided. Howard Days 2016 was a complete success and there are so many people to thank for such a fabulous event. The hot dog lunch, the Friday BBQ and the Saturday BBQ provided us with authentic Texas chow, the Gift Shop, Postal Cancellation Silent Auction and Swap Meet provided us with REH souvenirs. The Pavilion provided cool drinks and shade from the hot sun and is the perfect place for the ongoing Howard conversation and fellowship we all enjoy. The Friday Banquet hit an all-time record in attendance at 145! If you were there you knew that we had the Community Center packed to the rafters, there was much energy shown by the bidders at the Silent Auction and the chicken-fried steak was as Texas as ever! 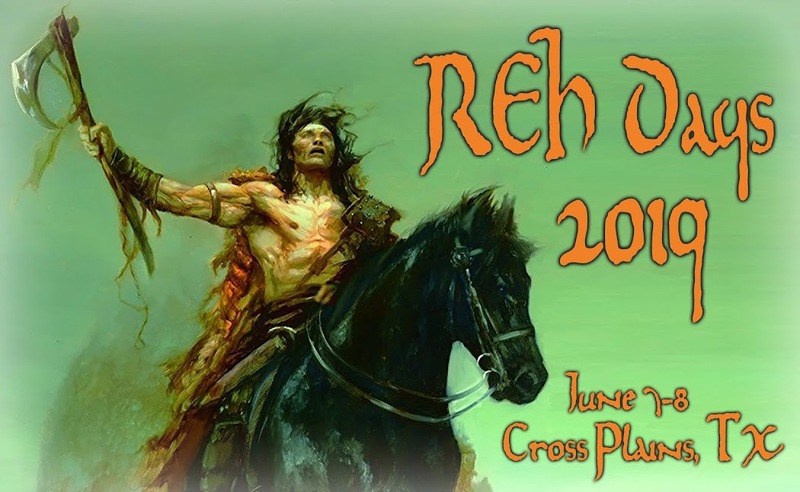 Thanks also go out to the Robert E. Howard Foundation and REHupa - the Robert E. Howard United Press Association and all their members in attendance. Said members always act like REH Ambassadors at Howard Days, which has become a family reunion of sorts for so many of us. And a big thank you to everyone who showed up to Howard Days 2016. Overall attendance was down only slightly, but you wouldn't know it from the numbers showing up for the panels. The lowest panel number was 75 with a high of over 100 for the Saturday ones. The interest in all aspects of Robert E. Howard continues with much enthusiasm. So now it's time to not only reflect on this year's event but to do some preliminary thinking about next year's Howard Days. If this event taught us anything, it's that it comes and goes like the speed of Solomon Kane's rapier or Conan's sword or Steve Costigan's fists or El Borak's six-guns or Breckinridge Elkins working a crossword puzzle. Oh, wait...not so much that last one. Thanks to everyone! Two words for next year: "Y'all come!"